Bulbs ovoid, 3-4 × 1.5-2 cm, tunic brown. Leaves 4; blade flat, 20-40 cm × 6-10 mm, green to glaucous. 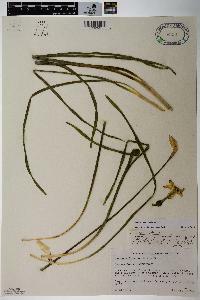 Inflorescences 1-flowered, 30-45 cm; spathe pale brown, 4-5 cm, papery. Flowers fragrant; perianth 5-7 cm wide; perianth tube 2-3 cm, gradually tapering to base; tepals overlapping, distinct portions spreading to reflexed, white, ovate-orbicular, 1.5-2.5 × 1.5-2 cm, apex mucro-nate; corona yellow with red, crenulate margin, cup-shaped, 3-5 × 10-15 mm; 3 short stamens included in perianth tube, 3 longer stamens and style exserted into mouth of corona; pedicel 2-3 cm. 2n = 14, 21. Flowering late spring. Roadsides, fields, waste places; 0--500 m; introduced; B.C., N.B., Nfld. and Labr. (Nfld. ), Ont., Que. ; Ala., Ark., Conn., Ga., Ill., Ky., La., Maine, Md., Mich., Miss., Mo., N.J., N.Y., N.C., Ohio, Oreg., Pa., S.C., Tenn., Utah, Vt., Va., Wash., Wis.; c, s Europe; expected naturalized elsewhere. 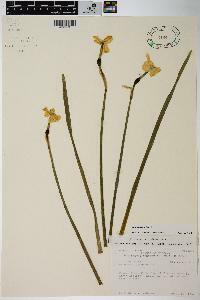 Natural hybrids between Narcissus poeticus and N. tazetta have been given the name N. ×medioluteus Miller (N. biflorus Curtis). These are more or less intermediate between the parents, and the inflorescence is usually 2-flowered. The tepals are white to pale yellow, and the short corona is dark yellow. These hybrids may persist in the flora area, as known from Alabama, Arkansas, Louisiana, Maryland, North Carolina, South Carolina, and Virginia. Habitally like no. 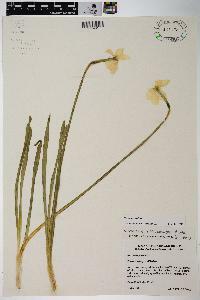 1 [Narcissus pseudonarcissus L.]; fls usually several; perianth white, 5 cm wide; corona saucer-shaped, less than a fourth as long as the tep, usually yellow with a red margin; 2n=14. Native of Europe, occasionally escaped from cult. into moist meadows in our range. Apr., May.